Construction was completed in time for the Grand Opening on Saturday 29th August 2009! See pictures, notes and opening arrangements on construction page. One of the conditions laid down by the Macclesfield Borough Council Planning Committee for the development of apartments on the top two floors of Clarence Mill was that there had to be a ‘106 agreement’. This requires the developer to provide funds to the local council which will be spent on local environmental enhancement. In the case of Clarence mill the 106 agreement specified a sum of about £30,000 to be used to provide a foot bridge across the canal at the southern end of the mill. This money was paid to the borough council who retained it pending construction of the bridge. For the past many years, ever since planning permission was granted for the apartments, negotiations have been continuing with one party or another to bring about the construction of this bridge. It has been a very long and sorry saga with many setbacks. However, all of these problems are now behind us and the bridge is built and open for use. 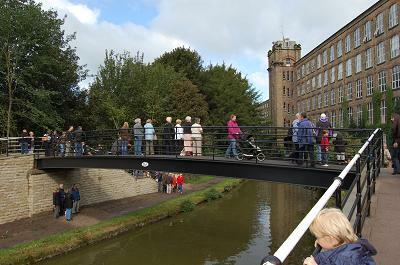 The picture shows the canal at Clarence Mill with the bridge in place and in use immediately after being opened. The bridge was opened on 29th August 2009. The total sum raised was about £165,000. The bridge actually cost less than this, but money was also required for a maintenance dowry – that’s why it seems such a lot. Various grants were obtained by the Civic Society thanks to the considerable efforts of Graham Barrow. Significant contributions were made by both Macclesfield Borough Council and Cheshire County Council – now amalgamated into Cheshire East Council. Why were the Civic Society involved? In reality every local body was involved. The canal was owned by British Waterways (BW). Cheshire East Council (CEC) and Bollington Town Council (BTC) both had an interest one way or another. However, none of these bodies were permitted to own such a structure. But there has to be an owner so it was decided that Bollington Civic Society should become the owner. This actually had benefits because we are a registered charity and that gave us access to funding which was not available to public authorities. The bridge was designed under a contract let to CEC. Their bridge architect, Noel James, recommended a standard structure spanning 16m across the canal at the point where the ground rises on both sides. As well as steps, there are ramps on both sides enabling full access for wheeled pedestrian equipment such as pushchairs and wheelchairs. The bridge is constructed of steel mounted on Kerridge stone faced plinths. The deck is slightly curved reflecting the curve in the stone bridges over the canal. The bridge spans both the water and the towpath so avoiding any problems of obstruction of the towpath for mooring boats or for the now rare horsedrawn boat.